THIS PAST WEEKEND I FLEW DOWN TO BEAUTIFUL JUNEAU, ALASKA FOR THE VERY FIRST TIME AND ALL I CAN SAY IS "IT'S BEAUTIFUL!!!" THE FLIGHT FROM ANCHORAGE TO JUNEAU WAS PRETTY FUN WITH SOME EXTREME TURBULENCE, LOUD SCREAMS THROUGHOUT THE PLANE BUT MOST IMPORTANTLY, OUR AMAZING PILOTS OF ALASKA AIRLINES KNOWS BEST ON HOW TO KEEP US SAFE AND LANDED BEAUTIFULLY IN JUNEAU. AND THIS IS ONLY THE BEGINNING!!! THE VERY NEXT DAY WAS GONNA BE A BUSY ONE. WE STARTED THE MORNING OFF WITH THIS BEAUTIFUL VIEW RIGHT BEHIND MY COUSIN'S HOUSE!!! WHERE'S MY STAND UP PADDLE BOARD WHEN I NEED IT??? WE THEN HEADED TO: SANDPIPER CAFE FOR BREAKFAST. THESE GUYS DON'T MESS AROUND!!! AND YES... I DID GET MY PANCAKE FIX... LOL!!! NEXT WE HEADED OVER TO VISIT MY OTHER OHANA, "THE KATASSE'S OHANA", LAST TIME I SAW THEM WAS IN 2011. ALL I HAVE TO SAY IS I'M BLESSED TO HAVE THEM IN MY CIRCLE OF OHANA. "THEY DON'T TALK BACK" A STORY WRITTEN BY MY FRIEND, FRANK KATASSE!!! Three generations of Tlingit men face the challenges of a summer of change. When 17 year-old Nick takes a floatplane from Juneau to his grandparents’ village, his arrival means changes for his fisherman grandfather, his cousin Edward–who hasn’t spent much time away from home–and his Desert Storm-veteran father. 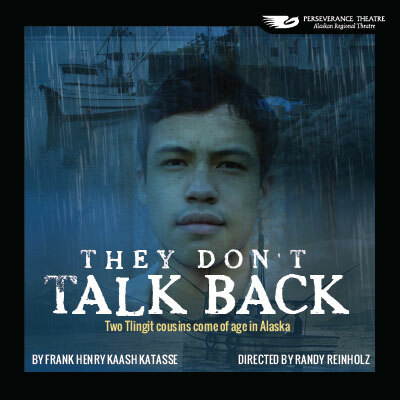 Just as these Tlingit men are adjusting to their new lives together, the boys’ grandmother delivers shocking news. A world premiere portrait of a 1990s Alaska family. A World Premiere produced in Association with Native Voices at the Autry and La Jolla Playhouse. MY AMAZING AND LOVING COUSIN, KA'IWA. THIS STORY HAD ME IN TEARS SEVERAL TIMES, I COULD RELATE TO THIS STORY TO MY OWN UPBRINGING WHEN GROWING UP IN HAWAI'I. I HIGHLY RECOMMEND THIS PLAY TO BE SEEN IF IT EVER TOURS IN YOUR TOWN. IN MARCH THEY'LL BE PLAYING IN ANCHORAGE, ALASKA!!! AND THE NEXT DAY... IT WAS TIME FOR SUPER BOWL SUNDAY!!! AND THEY EVEN HAVE MY HORSES AND STABLE... LOL!!! AND WHAT AN AMAZING SUPER BOWL SUNDAY IT HAS BEEN FOR ME WITH SOME OF THE GREATEST PEOPLE ON EARTH!!! YUMMY FOODS AND DRINKS AND BEST OF ALL... GOOD PEOPLE & COMPANY!!! AND BEFORE YOU KNOW IT... IT WAS TIME FOR ME TO HEAD BACK TO BETHEL, ALASKA. KAI'WA, JAYSEN, BROOKE, FRANK, ANGELO, MOM & DAD KATASSE, JACOB & PARKER, AND MANY MORE I COULDN'T REMEMBER BY NAMES BUT I'LL REMEMBER BY FACES. MAHALO NUI LOA FOR ALL YOU'VE DONE FOR ME AND MAKING MY FIRST TIME VISIT IN JUNEAU, ALASKA A MEMORABLE ONE AND FOR MAKING FEEL RIGHT AT HOME!!! MY WORKOUT ROOM IS FINISHED!! !